For those of you not old enough to remember 1988, Eddie "The Eagle" Edwards was Great Britain's first olympic ski jumper, and he became famous for finishing last! However, it was his determination to compete without funding (while still working as a plasterer) that caught the British public's attention - we always like an underdog. His biggest achievement was holding the British ski jumping record, although he also broke a stunt jumping World record (unrelated to the Olympics) when he jumped over 10 cars and six buses - now that's impressive. With the release of the 2016 biographical movie, Eddie has been thrust into the limelight one again. This had me wondering as to whether there was a costume available, as it would be great fun dressing up as the UK's most well-known ski jumper. 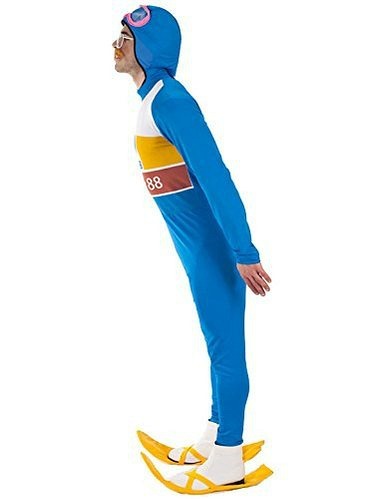 After checking the leading fancy dress suppliers such as Smiffy's and Angel's I was disappointed that nothing was available, However, thankfully, there is an outfit being sold on Amazon and eBay, which means this post can be completed with a positive ending and live up to its title! I managed to find an authentic-looking "Olympic Skier" jumpsuit costume which looks very much like the one worn by Eddie at Calgary in 1988. It even includes his number (42) and "Calgary 88" on the front. The jumpsuit also includes all of the accessories required which are the helmet, pink ski goggles, large glasses and yellow skis. Of course, none of these are real, and if they were then you would be looking at many hundreds of pounds. By the way, Eddie actually had to wear his glasses under his goggles as he was short-sighted and couldn't see without them and they would constantly fog-up making his challenge even more difficult. As I write, the costume is slightly cheaper on eBay and can be bought with click & collect at Argos if you live in the UK. The eBay link is geo-targeted and will work in all English-speaking countries including the UK, U.S., Canada and Australia, although I cannot guarantee the costume will be available in your country. 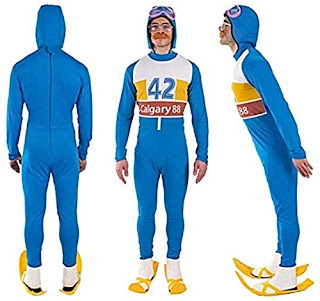 Now, although the costume isn't cheap, it does look authentic and is far cheaper than buying a real ski suit and the accessories. The outfit is quick and easy to slip into and could be worn to an event or party with a 1980s, movie or sporting theme. You would certainly turn heads and be instantly recognisable.